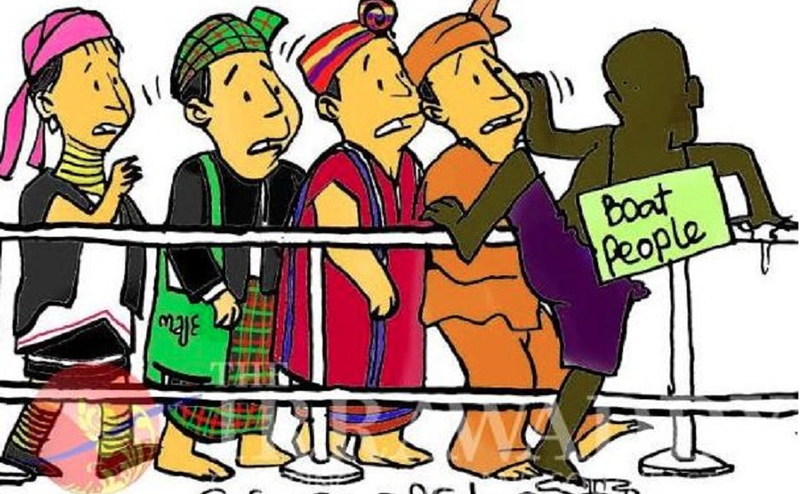 A CARTOON published by Burmese magazine The Irrawaddy has been slammed by critics as “disgusting”, “xenophobic” and “dangerous”. 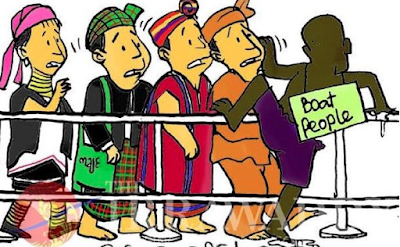 The offending cartoon features a dark-skinned individual with a sign saying “BOAT PEOPLE” hanging on his back cutting in front of a queue of Burmese ethnic minority groups. Many believe the individual climbing into the queue purportedly depicts an undocumented Rohingya Muslim. The minority Muslim group is a subject of contention in Burma (Myanmar), with many accusing the government of systematically persecuting them. Rohingya activist Wai Wai Nu has reportedly weighed in on the conversation, calling the cartoon “dangerous” and “insulting”. She called for the government to regulate cartoons which “discriminate against Muslims” in order to avoid conflicts. Nu also called into question The Irrawaddy’s editorial judgement in publishing the cartoon, a sentiment echoed by several critics on Twitter. Some say The Irrawaddy’s cartoon, which is strikingly similar to some published by French satirical magazine Charlie Hebdo, accurately portrays how many Burmese locals feel about the Rohingya. Charlie Hebdo – whose Paris office was attacked in 2015 by Islamist gunmen, killing 12 people – has published cartoons in the past that have been labelled “Islamophobic” in nature. The cartoon was a response to a series sexual attacks conducted against women on New Year’s Eve last year in Cologne, Germany. The cartoonist who created the image for The Irrawaddy, Maung Maung Fountain, declined to comment on the issue. All posts of the cartoon appear to have been removed from The Irrawaddy’s social media and website.